Imagine a reluctant reader shambling to the library for an author visit. He finds a spot near the back of the assembly hoping to zone out during the session, but he can’t help but notice this author seems different. Why does he have newspaper clippings in his pockets? Curious, the reluctant reader decides to watch. His eyes widen when the author claims the clippings are story ideas and the boy’s mouth drops open when the writer instantly fuses the clippings into an entire newspaper. Later, the boy howls with laughter at the presenter’s hilarious personal stories which inspired his mystery novels, and he nearly jumps out of his skin when the author recounts a scary incident that inspired his Keepers of the Vault series. At the end of the session, the reluctant reader bounds to the library desk and begs to take out one of the novels he just heard about. This is a regular occurrence at Marty Chan’s author visits. 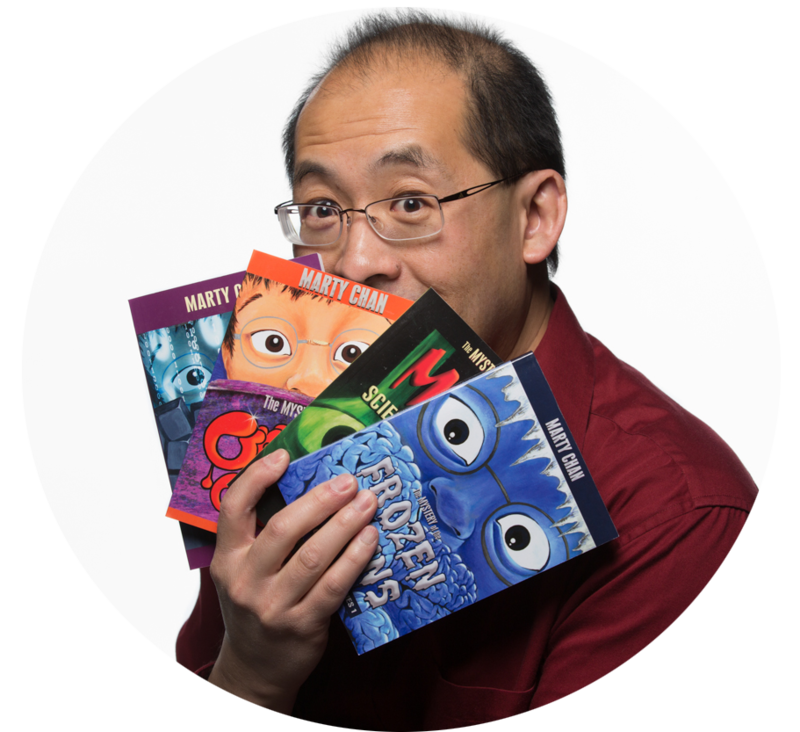 Marty combines his natural gift for storytelling, his passion for stage magic, and his love of literacy to create entertaining sessions that delight even the most jaded of students. He caters his sessions to each grade group and knows exactly the right story for the right situation. For K – grade 2 students, Marty introduces Asian folktales using a bag full of props sure to keep the kids riveted. His draw-and-tell story about the origin of the Chinese calendar invites students to guess what he’s creating, and he leaves the drawing as a souvenir that teachers can use to recreate the tale. He’ll reveal the behind-the-scenes process of writing and revising True Story, his funny picture book about his two cats. And he’ll improvise a story for the kids, turning a lucky few into the stars of the story. For grades 3 – 6, Marty reveals the personal experiences that inspired his novels, showing kids that their own lives can be springboards to great stories. He talks about his childhood experiences growing up as the only Chinese kid in a small Canadian town to highlight the discrimination and bullying he faced and how he survived. He shares a writing tip or two, demonstrating how details matter with a writing game that teaches descriptive writing and will have the kids begging to play again after he’s gone. With some stage magic, he reveals key writing concepts in an original and entertaining way. Grades 7 and up: Marty focusses on his signature play, The Bone House, to show teens that writing is best when it has an impact on the reader or audience. His discussion about this thriller keeps teens on the edge of their seats. Marty will also go behind the scenes of his Ehrich Weisz Chronicles to show students the value of research. He reveals some of the secrets he learned about the world-famous magician and escape artist, Harry Houdini and transforms one of the students into a modern-day version of Harry Houdini. Raised as the only Chinese kid in a small Canadian town, Marty learned firsthand what it was like to confront racism and discrimination on a daily basis. He had to rise above the stereotype of kung fu master and math whiz to show his classmates that he was a real person with real feelings. Very quickly, Marty learned that if he could make people laugh at what he said, it prevented them from laughing at what he was. As a result, he developed a style of self-deprecating humour that took him on a 25 plus year career as a humour writer, and Marty credits the start of that journey to his high school teacher. When Marty was in grade 11, his language arts teacher, Mr. Nigro, lit the spark that fuelled Marty’s passion for writing. Mr. Nigro asked Marty to write a description of how he would decorate his bedroom if he won the lottery. Marty created a dream room where his bed rested on an elevator that could lower to a library, video game arcade, home movie theatre, and indoor swimming pool. Mr. Nigro handed that assignment back to Marty and suggested he think about becoming an author. This one bit of encouragement gave Marty the confidence to pursue creative writing and stick with it despite the many rejection letters in the early part of his career. As a writer, Marty has enjoyed success in multiple fields. In theatre, his hit adult comedy, Mom, Dad, I’m Living with a White Girl toured across Canada and had a successful Off-Broadway run in 2004. His thriller, The Bone House, has frightened audiences in Edinburgh, Calgary, and Chicago. He worked as a story editor on three different kids’ TV series in the 1990s, which sparked his love of writing for kids. He wrote and performed a six-year weekly commentary series on CBC Radio and penned two CBC Radio dramas. He’s a regular TV panellist for Alberta Primetime’s news magazine show. Marty’s first middle-grade novel, The Mystery of the Frozen Brains, was inspired by his childhood experiences growing up in a small Alberta town. It went on to win the 2004 Edmonton Book Award. In 2016, the Alberta Foundation for the Arts named Marty one of the 25 most influential Alberta artists of the last quarter century. The Alberta Teachers’ Association Edmonton local recognized Marty as a Friend of Education for his many school visits over the last decade. When Marty’s not writing or doing author visits, he’s busy learning a magic trick or two. His favourite trick to date is escaping from a straitjacket, which he promises to show off at his author visits. His latest passion is the #MartyChanLegoProject, in which he documents on Instagram the creative process using Lego bricks. You can see his wry sense of humour on Twitter by following @Marty_Chan or viewing his Facebook page. “Wow! What a performance! It is hard to say who enjoyed it more, the students or the staff. We were all captivated with Marty Chan and his engaging, entertaining, and informative presentation. The students were asking for him to come visit us again minutes after the presentation ended.